Tag line: "It Only Dies If You Do"
Set shortly after the events of 2000's Ginger Snaps, Ginger Snaps: Unleashed follows the exploits of the only remaining Fitzgerald sister, Brigitte (Emily Perkins), who you'll recall infected herself with werewolf blood in an unsuccessful attempt to save her sister (who was already a werewolf), Ginger (Katharine Isabelle). Now alone in the world, Brigitte searches for a cure to her condition, all the while pumping Monkshood, a drug that slows the canine transformation process, into her veins. After losing consciousness following a close encounter with another werewolf (one that's been following her everywhere she goes), Brigitte awakens to find herself in a drug rehabilitation clinic (the authorities assume her Monkshood is a stimulant of some sort, and that she's addicted to it). Cut off from the only thing that prevents her from changing into a bloodthirsty monster, Brigitte befriends a young girl named Ghost (Tatiana Maslany), also a patient, who promises not only to get Brigitte her Monkshood back, but to help her escape as well. 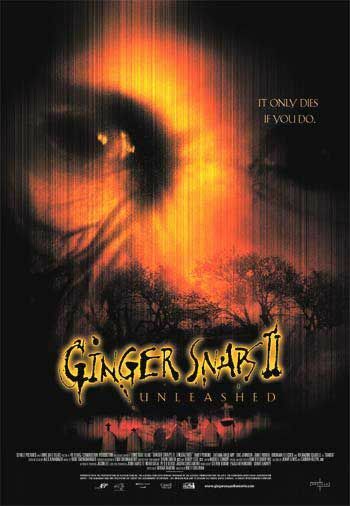 I definitely had a few concerns going into Ginger Snaps: Unleashed, chief among them being the direction in which the filmmakers were going to have to take their story. For me, one of the strongest elements of the original Ginger Snaps was the relationship that existed between the two sisters, the strong bond they shared that both assumed would last forever. Well, it didn't (nothing like a werewolf transformation to break up a happy family). Aside from reducing the duo to a solo act, I also had a few apprehensions about which sister's story was going to be the one that continues on. For me, Ginger was always the more interesting of the two, and while Perkins was absolutely fine as Brigitte in the first film, she seemed to quietly fade into the background whenever Isabelle's Ginger was on-screen. Needless to say, I was worried. One of the biggest, and most pleasant, surprises surrounding Ginger Snaps: Unleashed was how it took these worries of mine and turned them into positives. With the spotlight set squarely on her character this time out, Perkins delivers a superior performance, conveying all the impatience and frustration one would expect from a girl who knows she's a danger to society, yet is, at the same time, cut off from the one thing that will prevent her from becoming so. With a much more pronounced edge to the character than we experienced in Ginger Snaps, Brigitte is no longer content with remaining quietly in the background, and as much as Isabelle's Ginger commanded our attentions in the first film, Perkins' Brigitte downright demands it in the sequel. Of course, not everything has changed. The werewolf attacks in Ginger Snaps: Unleashed , like in the oiginal, pack a pretty strong wallop, as one poor librarian named Jeremy (Brendan Fletcher) learns all too quickly. However, I'm not recommending Ginger Snaps: Unleashed for what it successfully duplicated from the first film. I'm recommending it for taking what was essentially a unique concept only 4 short years earlier, and putting a fascinating new spin on it. Robert: Thanks so much for the kind words. We're very happy you enjoy the show, and I will definitely pass your comments on to the other hosts. Thanks also for stopping by the blog, and for listening to Horror Jungle. @Anonymous: We're glad you enjoyed the show, and thanks for listening! @Sailorpus: Thanks so much for the compliment (always nice to hear), and thanks also for listening! how goes it shocker man? ginger snaps was good the sequels stunk. Good evening, this is Rosella from Italy and I am leaving five reflections about the Horror Jungle Podcast. 1-The host's DVD recommendations with the music is entertaining. I like how each host can choose one of their favorite movies to recommend in their field of expertise. 2-The fusion of 8 ratings per review is an excellent guideline. 3-The podcast is always upbeat with no downtime. 4-No obscenities. I listen at home and even my young teenagers do. I never have to worry about the children hearing lewdness. 5-Addicting. The podcast always seems to go by so quickly, leaving me wanting more. I love hearing about the hosts and the horror films. @Rosella: Thanks for stopping by, and for the flattering comment! We certainly do appreciate it. We're so glad you like the show (and are happy you're able to share it with your family as well). I'll be sure to pass your remarks on to the other hosts, who will undoubtedly be just as humbled by them as I.
I'm a huge fan of Horror Jungle!!!!! Super Pod. We're glad you enjoy the show, and we thank you for listening. It means a lot to us all. @Layne: Thanks for stopping by! We're glad you enjoyed the podcast, and we certainly appreciate the compliment. Thanks so much for listening! outstanding conservations on the two movies - mixed with the eight dvds - makes for one supreme podcast. Hello, and thanks for the kind words! We're glad you enjoyed the podcast, and be sure to stop back and let us know what you think of the films (when you get a chance to watch them)! Thanks for stopping by, and for listening to Horror Jungle. I have listened to 3 other reviews on Insidious and the Horror Jungle hosts by far exceeded all of them. Outstanding review hosts. You are my new favorite horror podcast. @Quianna: We certainly appreciate the compliment, and we're glad you liked our discussion of INSIDIOUS. We thank you so much for listening, and for taking the time to get in touch with us. It truly is appreciated! @Geoff: We're glad you're enjoying the diversity of the recommendations (and I do look forward to your opinions on the other 4 films). Thanks for taking the time to leave a comment, and for listening to Horror Jungle. @Cyndy: Thanks for stopping by! Glad you enjoyed the show. As for weekly, I can honestly say it isn't "in the cards" for anytime soon, but who knows what the future will hold.